If you purchased Lite or Express on Google Play, you can upgrade to PRO at a discounted price via In-App purchase. 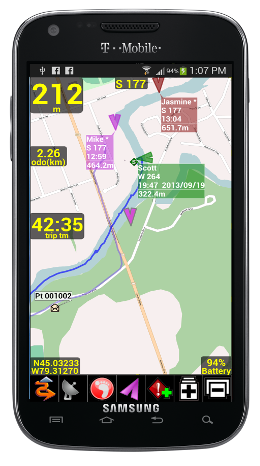 PathAway PRO Edition has all of the features of PathAway GPS 5 - Express Edition plus new features targeted towards power users and professionals. Of significance, PathAway PRO has 2-way wireless remote location tracking. See where others are right from your handheld, share your location with others, or send to a central tracking service. Also, with PathAway PRO, you can view your route or track on the Profile View Screen to see your location and speed on an elevation profile map. PathAway FindMe offers a simple online service where your can share your location. After posting your location to the PathAway FindMe service, go to http://pathaway.com/findme to view the last location on a Google map. Automatic Time Interval: Send location at the specified time intervals. Automatic Distance Interval. Send is triggered every x distance traveled. Automatic Distance Interval from Start. Sends your location as you cross the threshold of the specified distance from your start location. If you move back towards your start location, the trigger will again send the location. 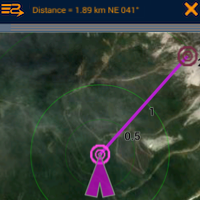 This feature is very useful for search and rescue purposes where the distance from a start location is needed in order to determine a search radius. As new Remotes are retrieved, they are assigned a default background color for display on the map. This color can be modified by Editing the Remote Item Info. Remotes are tracked by their ID passed along with the location message. The Label for a remote can be modified by the user for easier on-screen identification. Retrieval is achieved either when an SMS message containing location information is received, or via automatic or manual polling of an Http-based Tracking server. For Servers that return timestamp information, PathAway will download only updated location information. - For each remote location being tracked, the tag on the map can display current location and heading of remotes, course, speed, elevation of remote, date/time of retrieval, distance to, course to, and elevation difference. 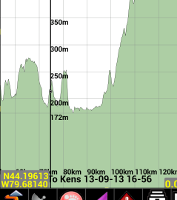 Elevation and Speed Profile view for tracks and routes. View and follow your route based on elevation stored in the route data. Analyze your track log speed and elevation. With Pro you can select multiple tracks or routes to display on the map at the same time. If you have recorded many tracks, or you've imported multiple routes then now these can be visible on the map at the same time. 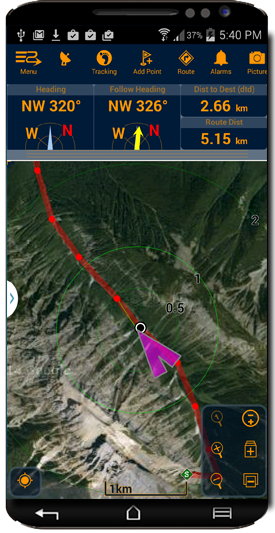 The Routes and Tracks dialog's "Show" option, enables you to select which data to show on the map. In addition, you can store points in multiple Points Databases and select which Points database to display on the screen. A great way to declutter your map views. Want to know the distance between 2 points on the map? With the Measure tool you can just click 2 points to get the distance and direction. You can also determine the area coverage of one of your routes, or recorded track logs. Improve the accuracy of a captured point using the "PinPoint" feature. PinPoint will take multiple samples of the same location to "average" a more precise position. PathAway FindMe offers a simple online service where your can share your location. After posting your location to the PathAway FindMe service, go to http://pathaway.com/findme to view the last location on a Google map. 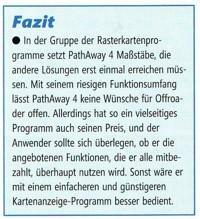 PathAway also supports the most common GPS Tracker protocols. Http location posting can be configured to send to a tracking service of your choice. As new Remotes are retrieved, they are displayed on the map with optional detils such as heading, course, speed, elevation of remote, date/time of retrieval, distance to, course to, and elevation difference. Included are options foe cycling through to view the location of each remote. Retrieval is achieved either when an SMS message containing location information is received, or via automatic or manual polling of an Http-based Tracking server. With the Measure tool you can just click 2 points to get the distance and direction. You can also determine the area coverage of one of your routes, or recorded track logs. For those with a large number of Maps to manage. 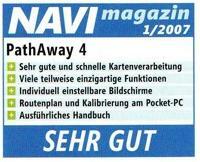 PathAway PRO allows the selection of any folder on the internal or external sdcard to be used for storing and retrieving maps. Modify color and width of the tracks, routes, and other lines displayed on the screen. Modify the dashboard colors, and other UI elements. Choose from 3 different position markers and adjust their size and color. On all items, you can also define the level of transparency in order to not clutter the map. In addition to the off-track and altitude warnings, turn instructions, and proximity notifications, PRO now offers different alarm sounds for left and right turns, left and right of off-track warning, and high and low elevation warnings. Enter a street address, then choose from the closest points found. Choose whether to show the point on the map, add a new point, or navigate to the address location. 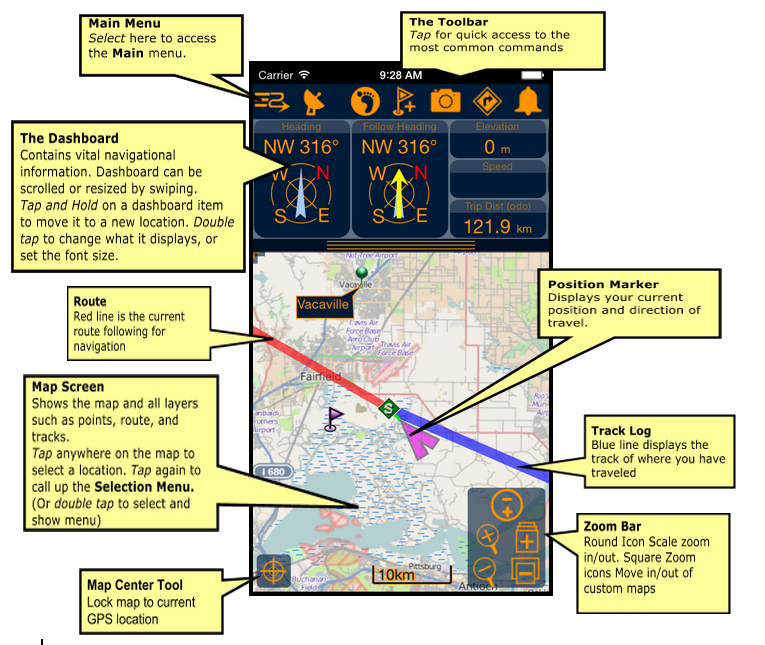 Display radials around the map center location showing distances or estimated time to surrounding areas. Modify each different type of alarm sound to suit your preferences. Improve Accuracy of captured Points. Adjust your custom map calibration using nudge controls, or by adjusting the location of the known points on the map. Insert turn or en route instructions along a route to offer added route guidance. Special alarms will sound for each turn instruction approaching and reached. This feature will force the system to target the next route point ONLY after you've reached the current point. You can even set it to manual route advance, where you must select the Advance command before the system will move on to the next point. - Adjust Settings to show/hide Line to Next Point, Line to Next Turn, Circle Next point and turn. - Adjust how time estimates are determined. Ie. 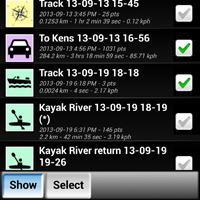 Based on Active route, current speed, average speed, activity preset speed, or custom speed. - Adjust Off-Track warning threshold, for route width, and elevation. - Adjust zoom level where icons and text labels start to display. - Primary and Secondary Coordinate display. View multiple coordinate types (Ie. lat/long and UTM) on your dashboard at the same time.